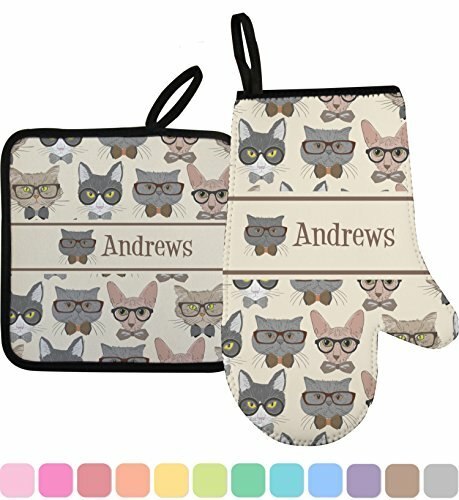 These matching oven mitt and pot holder sets add that finishing touch to your kitchen. Combine the sets with other items from our kitchen collection, and you have a great shower, wedding or housewarming gift! The mitts have a full design on the top and textured surface on the bottom for easy grip. The pot holders are decorated on one side and quilted on the other side and trimmed with black piping. Both have loops to for easy hanging. As always with YouCustomizeIt, you will be able change anything about this design (patterns, colors, graphics, etc.) for free. Our design library is loaded with options for you to choose from, or you can upload your own. Need Help? You can always talk / chat with our design experts. This hipster cats design is perfect hipster cat lovers. The design has four different hipster cats in the background. We chose a vintage cream background, however, you can change the background color to any color that suits you. The design also looks stunning with a dark background. We chose a classic ribbon in vintage brown along with an image of one of the cats (all 4 cats are available) and name for personalizations. * Personalized just for you! If you have any questions about this product by RNK Shops, contact us by completing and submitting the form below. If you are looking for a specif part number, please include it with your message.